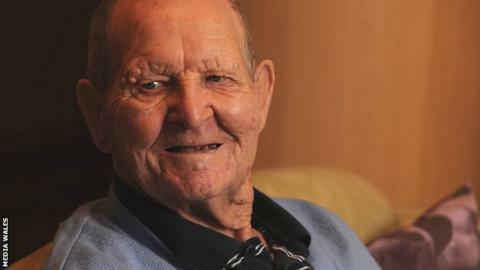 Tributes have been paid to former Cardiff City captain and Wales international Fred Stansfield, who has died aged 96. The no-nonsense centre-half led the Cardiff team that won the Division Three South title in 1947. He won his one cap for Wales against Scotland the following year when they beat Scotland 3-1. Cardiff City's website said: "Fred [is] among the most celebrated players in the club's history." After leaving Cardiff City Stansfield played for Newport County and was appointed manager at Somerton Park following his retirement as a player. He also managed Bedford Town in the Southern League before retiring from football to run a newsagents shop in Whitchurch, Cardiff. Stansfield was the oldest surviving Wales international player, an accolade that now falls to Harold Williams (Newport County & Leeds United) who is 89. Cardiff City have confirmed there will be a minute's appreciation before Saturday's Premier League home game against Crystal Palace, when members of his family will be present.